The Jason Street Mile High Comics is considered to be the largest comic book store and warehouse in the United States. The stores is over 45 thousand square feet and hold over 10 million comics. Mile High Comics is owned by the legendary comic figure Chuck Rozanski. Early in Chuck's career he found one of the greatest early comic book collection known in existence that has helped build up a comic empire. Chuck has gone to become a major player in the comic space and has even been depicted in some comics. Mile High will be particpating in the Halloween Comic Fest event on the 28th. They will also have an auction on sight. 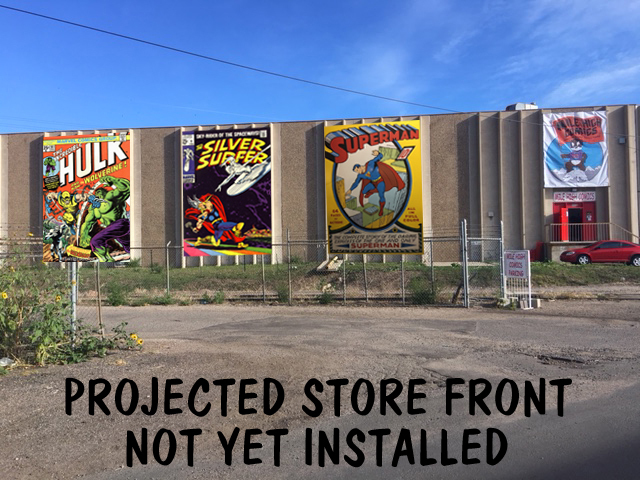 The store plans to use proceeds from Auctions to spruce up its exterior with giant pictures of comic covers. While the indoor of the store is full of amazing decorations the store has not done much to its exterior which looks like a typical warehouse. This project will change that and give it lively exterior that a store of its stature deserves. Doesn't that projection look cool? I have measured, and we have room for a total of 15!of these huge comics covers reproductions on our exterior walls. My plan is to spread out the cost by hosting an event each month to fund the cost of one cover, with ourauction on the 28th being the first. If you could please save the date and try to visit us on the 28th, we would all appreciate it very much. We'll have photos of auction items online for you very soon. Yes Chuck I do think that looks cool and I will swing by on the 28th to help support the cause. This post was brought to you by Marvel Matt.